Hi Everyone!! Welcome to this week's "Gift Idea For The Book Lover"! I've been thinking about how we store our books. I have floor to ceiling bookcases though they are not complete. I need to redo the floors before I make the bookcases "built-in' to the walls. There are so many different styles of bookcases besides what is usually seen at the big stores. Granted, these unique ones tend to be on the pricer side, but oh the personalities on them. 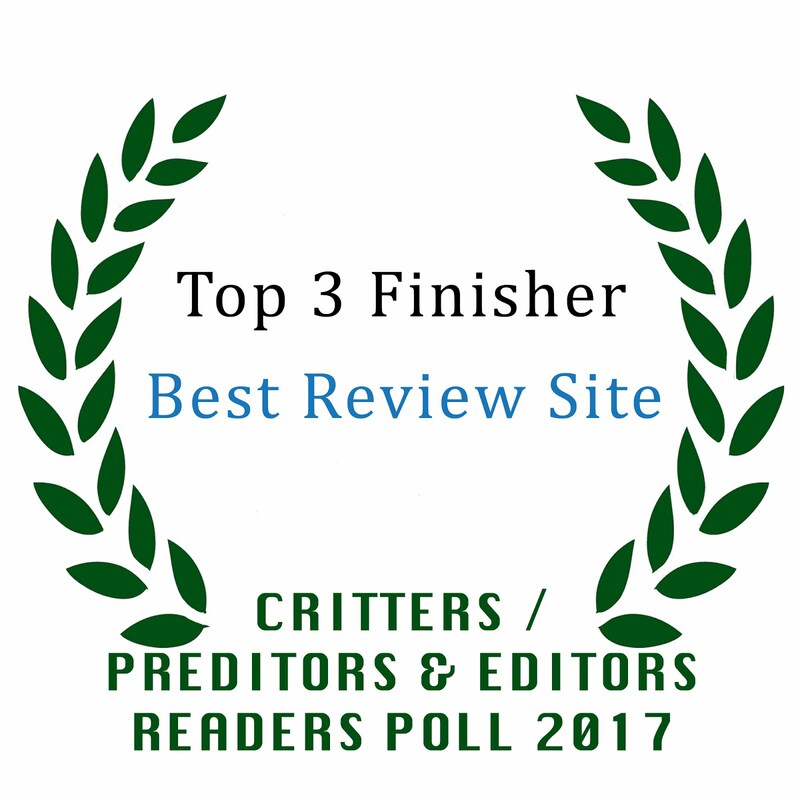 I found a few that are too cute, unique and interesting. These are also great to spark some ideas for your home as well!! Let me know which one you like! Beautiful handmade in the USA, curved bookshelf...Built of 3/4" oak plywood with a stain and flat black enamel finish. This piece is original and will compliment any room. Features an edge routed, solid oak top. Stain shown is red oak, but different stain shades can be specified. Dim. 4ft tall, 10" depth, 23" wide at base. 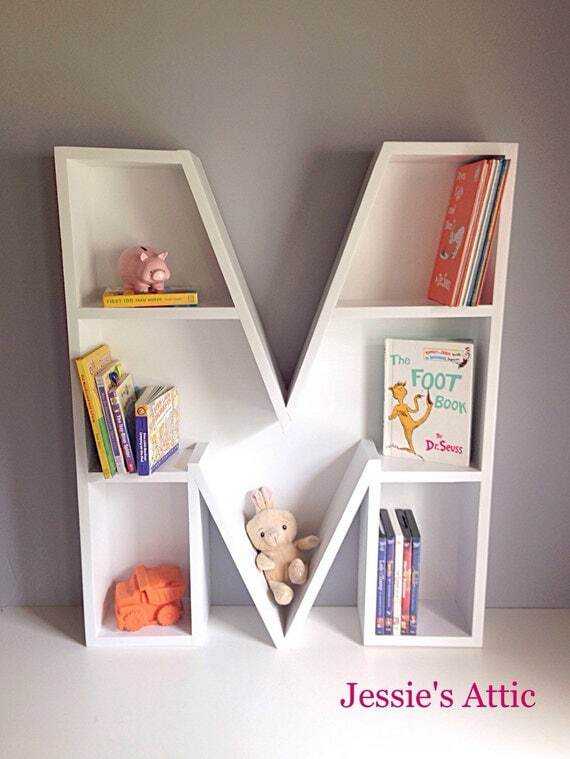 These alphabet bookcases are the perfect way to personalize your child's room. Handmade out of beautiful pine wood. This shelf ships fully assembled. Note: Because of its 5.5" depth these bookcases are better for youth chapter books, small baby books, and displaying knick-knacks. Larger books may hang out further than shelf. Fully upholstered button-cushion club chair with armrests and a built in 27 feet of shelf storage for books and DVDs. 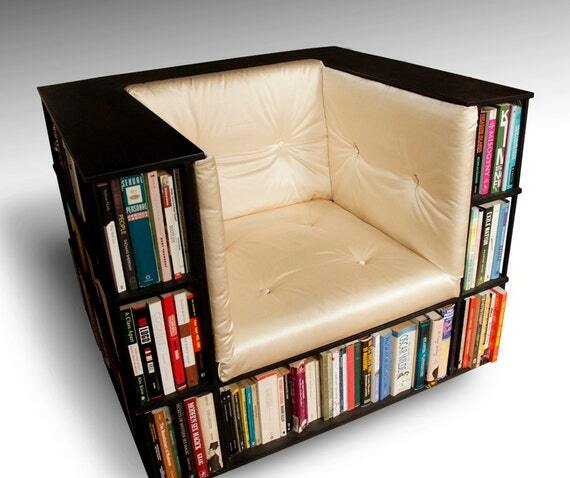 Very comfortable deep seat, perfect for sitting and reading, enveloped by your library! Secret compartment under seat, accessed from behind bottom shelf books, for hiding away those extra special things. On rolling castors for easy movement. Can be upholstered in any material and painted in any color. Stained veneer surface available on top at additional cost. An original Alexander Love design. Made to order, ships in 3-4 weeks. 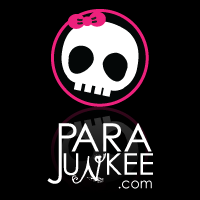 Please contact me with your zip code for a shipping quote. This handcrafted boat bookcase is made from pine tongue & groove boards, cedar wood on the railing and cherry wood on the bottom and top trim pieces. It has four 9" deep shelves made of pine and no knots. Brass screws are used throughout. 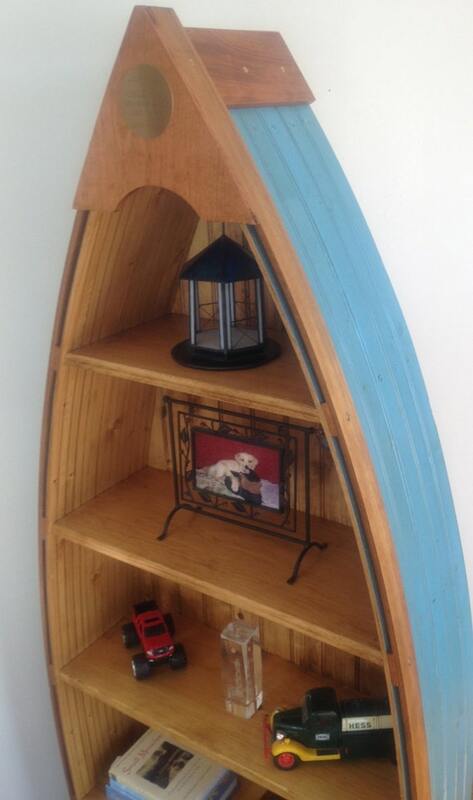 We custom finish each boat bookcase according to your specifications. The entire boat has a polyurethane finish to seal and shine. This beautiful piece will go anywhere from the family room to a child's room to the cabin in the beach house or office. 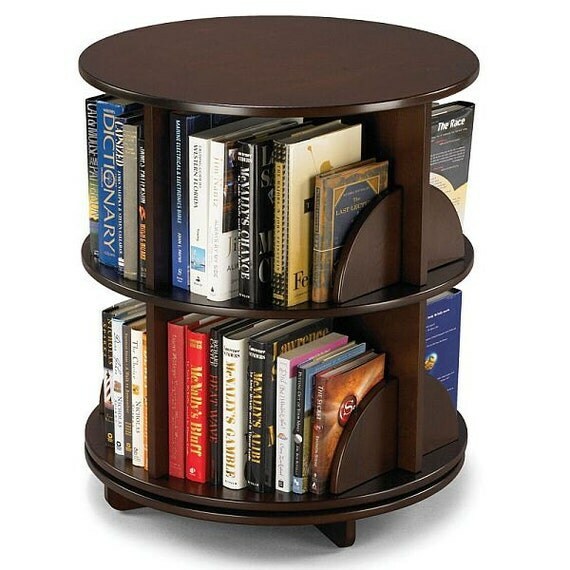 Our Classic Lazy Susan Carousel Revolving Bookcase offers access to your books with a gentle spin. With a 24" diameter, the bookcase doesn’t take up a lot of floor space but offers a tremendous amount of book storage. This Bookcase adds style and storage to your home as a finely-crafted piece of furniture. Spins and rotates to allow easy access to your books or home décor accessories. This bi-level bookcase rotates 360º to provide easy access to reading material or décor items. 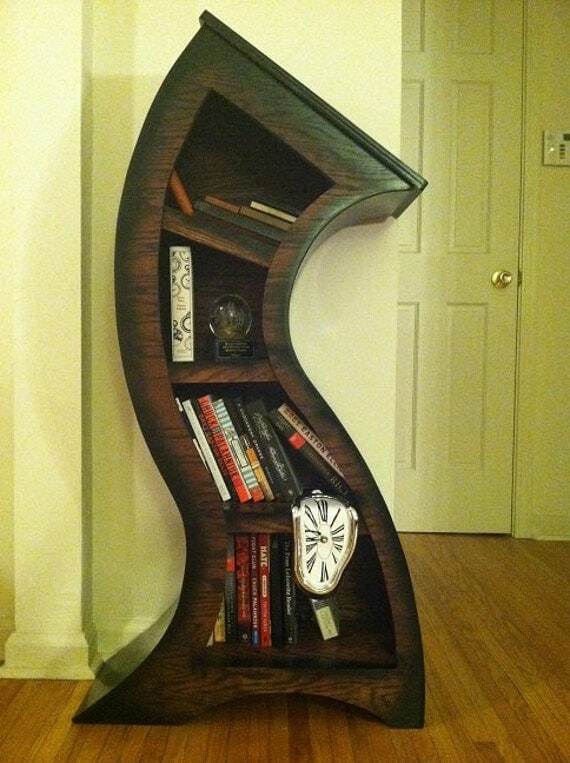 A simple turn spins the bookcase so you can browse all of its contents. It also has caster rollers, so you can move it to any place in your home at any time. Capable of holding twice as many books as traditional bookshelves of the same size, this revolving unit has 11" high separators/circular shelves with four separate quadrants on each shelf to accommodate paperback novels or unabridged dictionaries organized by author or discipline. One of the 14" shelves can be substituted for the 11" for a nominal up-charge. Occupying as little space as an end table, this bookcase saves valuable floor space in a room where full-size bookcases may be impractical. I'm selling these super cute -custom made tree branch bookcases. 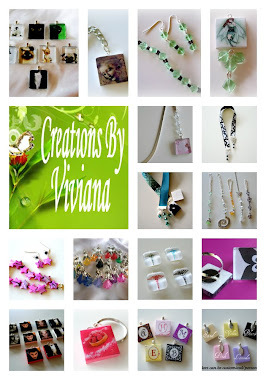 They are made by hand and look amazing! The book case is 68 inches tall and 44 in wide. 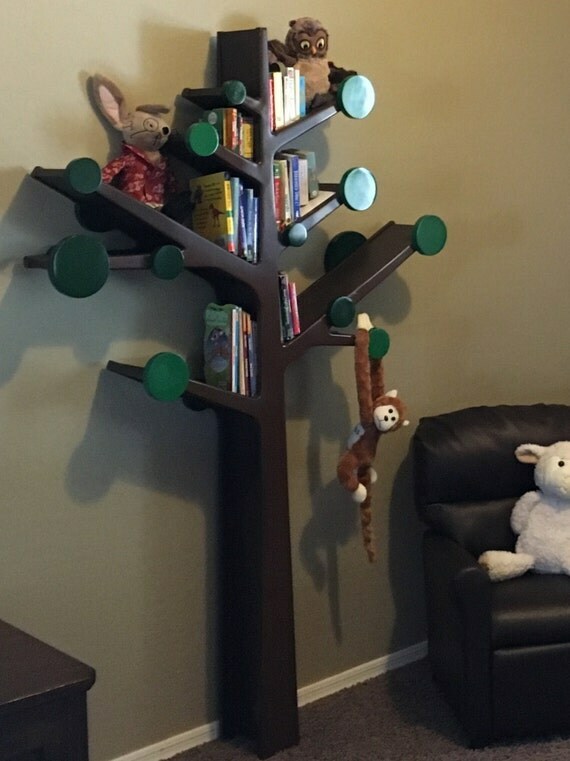 You can put books and stuffed animals on the branches and it really makes a child's bedroom unique. The color of the tree and the leafs (circles) are completely your choice. Just tell me what colors you want for the circles and the tree trunk. I can do up to two different colors for the circles per tree. for example -light green and dark green circles. The finish is satin and cleans easily. If you live near a home depot or lowes, you can walk in, pick your color paint, and let me know the exact color you want. That way the tree will be sure to match your room PERFECTLY. Since these are custom made to order they take about 2 weeks to make. Shipping is done through greyhound package shipping. 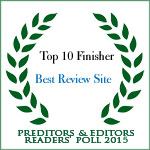 Ill crate up the bookcase and ship to the closest greyhound bus station to your address. Ill provide you with the details of when the package is scheduled to arrive. Here is a unique addition to any dorm room, a Bookcase that is stackable and easy to put together or take apart. Made from birch plywood, this shelf can be finished in a clear finish, or painted white, red, blue, green, or their school colors. Book case will be made out of 3/4" Birch plywood, no bad smelling MDF is ever used in our products. All the edges are rounded over for safety. They are mad to stack. Each one can be set on top of the other, and they lock in with each other to keep them from sliding off. They naturally lock in, no dowels to ruin the appearance. These are approximately 12" deep, 13" tall and 30" wide. We can do a custom size for you if you would like. A round rolling rack for all your (or their) books! 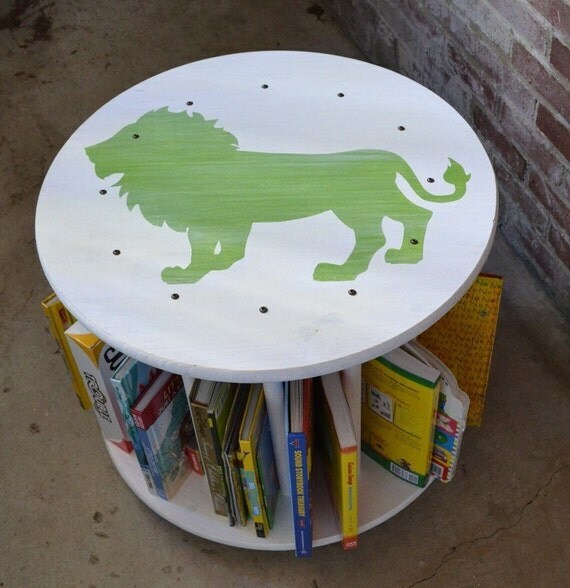 This distressed, hand made and custom painted book rack on wheels is a great addition to any home, whether it is used for books, puzzles, games, a game table or a bedside table. This bookcase comes in solid white, but a customized design and/or text for the on the top surface (as seen in picture) can be added for an additional $25. Dimensions are 24" round by 20" tall. To greatly reduce the cost of shipping, this item is shipped with some assembly required. All holes are pre-drilled and everything is included even the bit required for the brass screws. The casters come attached to the base. For assembly you simply need to place the wooden dowels into the counter-bored positioning holes and fasten the screws on the top and bottom. Instructions are included. 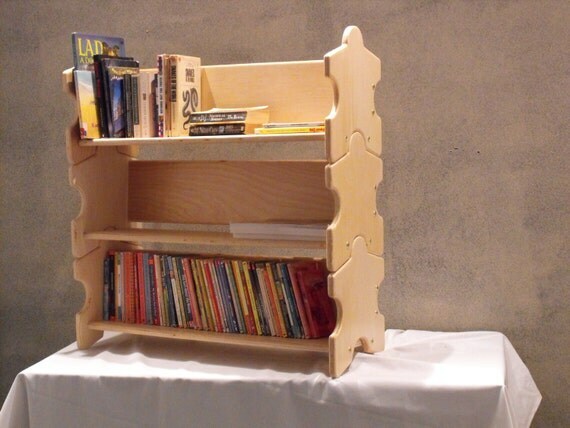 If you would absolutely prefer an assembled book rack, please contact us for additional shipping costs.